155 Children from 15 countries/regions fully enjoyed joining the 24th WCBF in Ehime Prefecture, held for the first time in Shikoku Island, from July 30 to August 7. The girls and boys of 10-11 years old learned from eight IBAF veteran coaches to play baseball and participate in cultural and other sport events to create goodwill and friendship, thanks to the hospitable people and environment of Ehime, surrounded by mountains and sea shores. Australia, Brazil, Canada, China, France, Germany, Indonesia, Mongolia, Mozambique (1st time), New Zealand, Spain, U.S.A. and the host Japan were invited to the event. 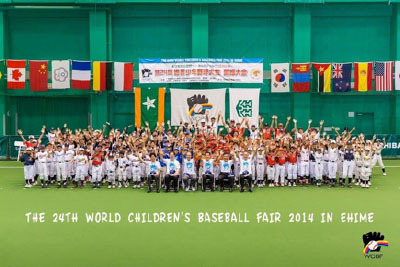 Children’s baseball teams from Chinese Taipei and Korea played friendly games with 12 teams in Ehime Prefecture. At successful conclusion of the event, Sadaharu Oh, 74, Chairman of the World Children’s Baseball Foundation (WCBF) and former Tokyo Yomiuri Giants great who slugged 868 carrier home runs, thanked a number of local organizers for their efforts and expressed his desire for the children to invite their friends to play baseball back home. Global development of the sport helps the ongoing drive to reinstate baseball and softball to 2020 Olympics. The eight IBAF nominated coaches were: Angel Bonilla (Head Coach､U.S.A. ), Yoshihisa Uchikawa (Subhead Coach､Japan), Edgar Perez (Puerto Rico), Darwin Barker (Canada), Martijn Nihoff (Netherlands), Alessandro Colombo (Italy), Daishin Nakamura （Japan） and Kenji Sugawara (Japan). The WCBF inaugural event was held in Los Angeles in 1990, and over 5000 participants - boys and girls of 10 and 11 years old - from 92 countries/regions have attended this global event.